It won’t get you very high, but it sure will make nearly everything you put it on taste exponentially better…like magic. This adaption of Melissa Clark’s Peruvian roast chicken sauce is one of the best things I’ve come across in a long time, and it’s just a matter of throwing everything into your food processor and pushing the button. 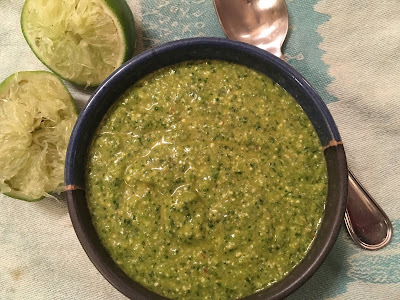 The ingredients include a bunch of cilantro including the stems, a quarter cup of crumbled feta cheese, two seeded jalapenos, a garlic clove, the juice from half a lime, half a teaspoon of Dijon mustard, a teaspoon of chili garlic paste, half a teaspoon of honey, half a teaspoon of ground cumin, and ¾ of a teaspoon of fine salt. No worries, there are lots of room for errors if you measure like I do. Chop everything up into small pieces, put in the processor, then drizzle in a half a cup of olive oil while it’s running until you get a smooth sauce. Quickly smother your chicken, pork, beef, fish, veggies, or grains with lots of it.